Tropical Cyclone Tracking and Analysis Software"
The original unedited transcript of the June 30, 1999 Tech arena presentation is available in EIIP Virtual Forum Archives <http://www.emforum.org>. The following version of the transcript has been edited for easier reading and comprehension. Typos were corrected, date/time/names attributed by the software to each input were deleted but the content of questions and responses are as stated by each participant. Answers from the participants to questions by the audience are grouped beneath the appropriate question to facilitate meaning.  For the benefit of our first-timers, when you see a blue web address, you can click on it and the referenced Web page should appear in a browser window.  After the first one, the browser window may not automatically come to the top, so you may need to bring it forward by clicking on a button at the status bar at the bottom of your screen.  We will start with a presentation, and then follow with a Q&A session for your questions and comments. Right before we begin the Q&A portion we will review the procedure.  Please do NOT send direct messages to the speaker or moderator as it makes it difficult for us to follow the discussion.  Background information for today's session may be found at <http://www.emforum.org/varena/990630.htm>. Today we are pleased to welcome George Sambataro, founder and President of PC Weather products. George has a background in meteorology and hurricane research, in addition to being the designer of the HURRTRAK program that he is going to tell us about today. Welcome George. I know this is a busy time of year for you, and we are really pleased you could take this time to join us. George Sambataro: Thanks Amy. Things are a little less busy now that the first batch of the new product has been shipped. Well, I was up till 1:30 AM last night putting part of this together. Much of it has been cut and pasted from my web site at <http://www.pcwp.com>. The topics that I am going to present are the Company's History, Staff, Products, and Services. 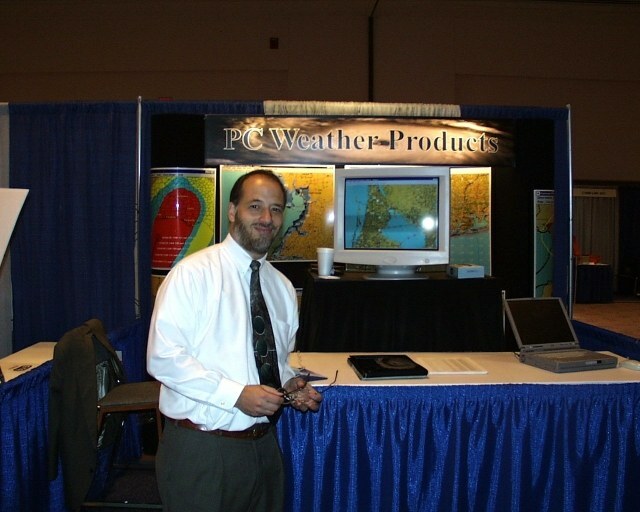 Founded in 1992, PC Weather Products grew out of years of research and Development headed by George Sambataro to find a more comprehensive way to track and analyze tropical storm and hurricane on a personal computer. This work resulted in PC Weather Products and the line of HURRTRAK Products and services. Interestingly, George began work on a computer based Hurricane Tracking System back in the early 80's on a Radio Shack Color Computer. The initial maps were hand-digitized using a Rand McNally atlas. Today, PC Weather Products specializes in Windows-based Hurricane Tracking and Analysis software designed for emergency management, insurance, disaster planning specialists and just generally anyone who has a "need to know". George is a degreed meteorologist who graduated from Florida State University in 1974. After a few years at NHEML (National Hurricane and Experimental Met. Labs) in Miami, George's focus shifted to computer software design and implementation at several Fortune 500 companies; ARCO, COCA-COLA, Georgia Pacific and IBM. Joe is a computer specialist based out of Longport, NJ who assists PC Weather Products with technical issues, web site design, and marketing support. Joe has been involved with the company since 1995. We have no decent photos of Joe : ) Now to the products. The company's premier software products, HURRTRAK RM/Pro, HURRTRAK EM/Pro and HURRTRAK Professional, offers an advanced set of functions and capabilities related to the analysis of Atlantic tropical systems, as well as, their potential impact to land/sea areas. Each product adds additional capabilities to the former. For example, Hurrtrak Professional is the "base" product. HURRTRAK EM/PRO has all of the capabilities of the Professional version plus many more. Hurrtrak RM/Pro has all of the capabilities of HURRTRAK EMPro plus additional ones. HURRTRAK Professional for Windows offers a complete set of advanced functions for storm tracking and analysis in support of anyone whose work depends on monitoring the progress of Atlantic storms and hurricanes. Features like detailed tracking charts, wind field analysis, location wind profiles, the ability to display the storm location and wind profile at any forecast interval (1-72 hours), makes this a powerful addition to your hurricane preparedness tools. Check out <http://www.pcwp.com/prod1.html> as it shows many of the functions within the system. There is not enough time to review all of the functions (thumbnails) but you may want to bookmark this page to review later. We have worked with emergency managers and disaster specialists to develop HURRTRAK EM/Pro for Windows. HURRTRAK EM/Pro is a product designed for the emergency professional whose work demands the highest level of information possible regarding hurricanes and their impact. Features like the MOM SLOSH and inundation analysis, coastal flood index, strike probabilities, storm animation, impact analysis, email capabilities, detailed reporting and enhanced decision support make this an essential tool. Check out <http://www.pcwp.com/prod2.html> to review its capabilities. Again, there is not enough time to review them all here now but a few of the key functions in the version are email capabilities - The user has the ability to send graphics and reports to email recipients. See <http://www.pcwp.com/emailsgta.html> for an example of a how this is done with a graphic. This should work with any email system. See <http://www.pcwp.com/emailsrpt.html> to see how this is done for a report. As you see, you can attach any or all of the NHC advisory text to the email note. ALERT EMAIL - This allows the user to establish triggering criteria, that when satisfied, will cause the automatic (or manual) generation of emails to a group of recipients. The triggering criteria is somewhat complicated but some example are show on <http://www.pcwp.com/emailalert.html>. This can be a powerful way to communicate important information automatically. Imagine your boss getting Email from you at 2 AM regarding a storm! While you sleep! SLOSH Analysis - This function displays the NWS SLOSH basin analysis on standard (fixed) charts. An example is shown on <http://www.pcwp.com/sloshinundationvalues.html>. The values indicated are either the "raw" slosh values or the inundation (water above ground) level. We worked with experts in the Disaster Planning, Emergency Management and Insurance Industry to develop HURRTRAK RM/Pro for Windows. HURRTRAK RM/Pro is a product designed for the professional whose work demands the highest level of information possible regarding hurricanes and their impact. Features like Zip Code Impact Analysis, Sophisticated Historical Analysis, and the new SLOSHView Inundation function, make this an essential tool for the professional who wants the "best". See <http://www.pcwp.com/prod6.html> to review the additional capabilities of RM/Pro. Key items of interest here are the zip code level of reporting as shown on <http://www.pcwp.com/fzip.html>. All of these reports can be printed, previewed on screen, exported to HTML or emailed. The new SLOSH inundation program is shown on <http://www.pcwp.com/sloshview.html>. We think this is exciting new addition to our products! By combining elevation data and SLOSH data, this feature is a powerful new way to view the potential impact from storm surge flooding for any areas from Brownsville, TX to Maine, including PR and the USVI. Take a minute to review this web page. Check out the Hilton Head, SC example on the bottom of the page <http://www.pcwp.com/images/svhhi.gif>. That's why they evacuate. Since 1995, we have been providing the HURRTRAK ONLINE service for customers with our software products... HURRTRAK Professional, HURRTRAK EM/Pro, HURRTRAK RM/Pro, and the Global equivalents. Over that period, its reliability and timeliness has been nearly flawless. Now in 1999, HURRTRAK ONLINE and the HURRTRAK software products are more integrated than ever before. With an Internet connection, the latest hurricane tracking data is retrieved by your system whenever the new data is updated on our servers. Not only do you "never have to enter data again", now you don't even have to request it again! This capability also allows us to put additional automation features into our products, i.e. trigger the automatic sending of email and printing of reports. Direct Dial modem connections are also available to get the data. Check out <http://www.pcwp.com/prod5.html> to get a better idea of what this service looks like. The best way to get the data partially depends on the type of connection you choose; Modem, Internet Dial UP or Internet (24-hour access). Well that covers our History, Staff, Products and Services. At this point, if it is OK with Amy, we will entertain any questions you may have. Amy Sebring: Thank you very much, George. I am sure we will have a few questions. Audience, please enter a question mark (?) to indicate you wish to be recognized, go ahead and compose your comment or question, but wait for recognition before hitting the enter key or clicking on Send. We now invite your questions or comments. I would like to comment that I know at least a few NWS offices use your product! Kevin, when you are ready, please. Kevin Farrell: You've mentioned that the product runs on Windows. Do you have Macintosh or Unix versions too? George Sambataro: No, sorry. The new versions only run on WIN 95/98 or NT. Marilyn Barker: I have RM/PRO and noticed that on view data that the advisory text is not there as in previous years. Am I looking in the wrong place? George Sambataro: It is. Give me a call at 800-605-2230 after the session and we will figure out what is going on. Steve Charvat: George, can you please give us your email address for future reference? Amy Sebring: Do you know of any examples where email notices are being forwarded to pagers? I would expect that could be set up without too much difficulty? George Sambataro: Since this is a brand new feature, I have not heard of anyone doing that but what the system is sending is standard email messages. So if it works with standard email, it should work with this system. Kevin Farrell: Re: Amy's email/pager question. I just tested my SkyTel pager and the email function works. Send mail to <[email protected]> and the message goes thru. Therefore, WX alerts could be forwarded to an alpha pager. Amy Sebring: George, one of the features that I found very useful was displaying the average forecast error. Are there any changes there or any developments with the hurricane center? George Sambataro: The NHC likes those kinds of views since it shows the uncertainty of the track. Amy Sebring: Also, you might mention the historical analysis? George Sambataro: The system contains a separate program that allows you to view and analyze the storms from 1886 - 1998. Search criteria include the ability to show all storms that passed within a certain distance of a point with a defined level of wind. Terry Storer: As far as data availability, are the vortex data messages available from NHC? George Sambataro: You are talking about the recon data and they are available in various places on the net and otherwise. George Sambataro: Are you interested in having the HURRTRAK Online system deliver those? Avagene Moore: George, are your products used internationally? Have you expanded to the global market at this point? George Sambataro: We have Global versions of the EM/Pro and RM/Pro products. You can get a complete description on our web site but basically they have most all of the same capabilities as the Atlantic version. We do have quite a few global customers from UK to China. Amy Sebring: I am really pleased to see the enhancements to the SLOSH analysis but I noted the caution at the street level. My recollection is that the margin of error on SLOSH data is estimated at 20%. George Sambataro: Regarding SLOSH. The SLOSH data, especially far away from the analysis area is not meant to go down to street level. IT can be used as a quideline but not taken literally. Ellen Faux: To clarify - does your system track Pacific storms automatically or do we have to input the data manually like last year? George Sambataro: The Pacific data still needs to be hand-entered but we are looking at a way to make it easier on you. That might take a while so if my short answer here is not sufficient, call me. Ellen Faux: Can't wait - thanks. Marilyn Barker: Can you tell me more about Action Points? 2nd - They will show up on location hourly detailed reports in the action column at the time they are forecasted to occur. Hope that helps some, if not, call or see the reports page on my web site. Marilyn Barker: So they should be set depending on specific geographic information? Like ours would be different from, say, Puerto Rico. George Sambataro: Definitely. They are defined for a location. Amy Sebring: George, are you going to be exhibiting at any conferences this summer, or do you stay pretty close to home during the season? George Sambataro: This summer will be close to home. I normally attend the National Hurricane Conference and the Florida Conference. Amy Sebring: My recollection is also that any of the graphics may be saved in jpeg format for upload to Webpages, for example? George Sambataro: jpeg, pcx, tif or bmp. You can use the images on an internal INTRANET but not on the Internet (without special LA). Amy Sebring: Right, thanks for clarification. Amy Sebring: Thank you very much for being with us today, George. We hoped you enjoyed it and wish you good luck with HURRTRAK and PC Weather Products. And a not TOO busy season!! Amy Sebring: Ava, can you give us a heads up for upcoming events? Avagene Moore: Thanks, Amy. First of all, excellent presentation today, George. Thanks. The EIIP Virtual Forum starts July with a Community & Family Preparedness (CFP) Round Table next Tuesday, July 6, 12 Noon EDT --- Rocky Lopes from the American Red Cross will tell us about a new manual of interest and importance, "Talking about Disaster." On Wednesday, July 7, 12 Noon EDT, Jim McGinty will discuss Bomb Threat Management in the Virtual Classroom. Jim is a retired Commander of the Philadelphia Bomb Squad, who has started his own company, Protection Planning. He lectures all over the world and is Chairman of the Police Officers Tactical Operations Association. You will want to hear this expert on this topic. That's all, Amy. Amy Sebring: Thank you, audience. We will adjourn for now, but you are invited to return now to the Virtual Forum room to thank our guest and have some further open discussion.